Baba Roots - ein Kult-Energy-Drink aus Jamaika! Ohne Alkohol verleiht der aus 100% natürlichen Zutaten fermentierte Drink neue Kräfte. Darf auf keiner Reggae-Party fehlen. Aber auch gesundheitliche Aspekte sagt man Baba Roots nach. So soll es begünstigend wirken auf Leber, Niere, Magen, Verdauung, Blutdruck und Diabetes. Versuchen Sie als Alternative doch auch mal den ähnlichen Roots-Drink Zion aus meinem Shop. Rezeptideen für Cocktails mit dem Baba Roots Drink finden Sie auf der Webseite von Baba Roots hier. Zutaten: Wasser, Brauner Zucker Melasse, Similax Balbisiana, Similax Regelii, Farn Dryoteris Filix Moss, Morinda Royoc, Honig, Rytidophyllun Tomentosum, Cassia Occidentalis, Vitis Tillafolia, Trophis Race Mosa, Alysicarpus Vaginalis, Coconueifera, Mentha. "Einfach unglaublich und unvergleichbar. Schmeckt nach Wurzel, aber man merkt wie es wirkt. Herzlichen Dank..."
"WESTERN BUREAU - Rastafarian William Webb is the force behind the production of an increasingly popular brand of roots tonic called BABA Roots that he developed in Darliston, Westmoreland four years ago. Webb, 45 years old, was deported to Jamaica from the United States in 1994, apparently for a misdemeanour. But, determined to escape destitution, he hit upon the idea of making roots tonic, which is a popular drink among grassroots Jamaicans. He called his product BABA Roots - BABA being the acronym for Basic Administration for the Benefit of Africans. The drink became an instant success. With 38 employees, Webb is also realising his dream of helping to provide gainful employment to residents - and particularly the youths - in Darliston where he grew up. 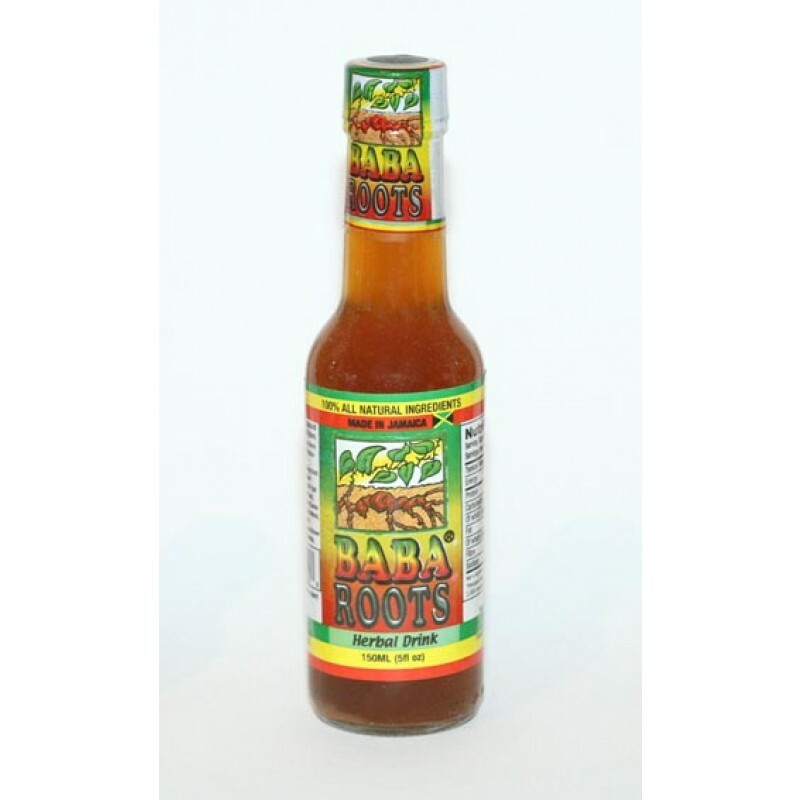 Webb, who was stuck with the nickname "Baba", confidently claims that his roots tonic purifies the blood and lowers cholesterol even as it works as an antacid, and helps to balance digestive disorders. If consumed in the morning, he says on the label, it stimulates the mind and body, while if consumed at night, it soothes the nerves, allowing the individual to get a good night's rest. "I formulated this company as a home project, as a cottage industry, with hard work and vision," Webb says in an interview with the Sunday Observer. "I experimented with higglers and farmers who are some of the hardest working people in Jamaica," he adds. The feedback from such workers was positive and he was motivated to continue in his efforts "because if the hardest working Jamaicans could demand this product, so could the rest of the world". Having tested the product, the challenge was then to get it to market, and, for a man with little financial resources, it would prove no easy task. "I used to walk around with box on my head, bags on my shoulders and bottles in my hand from market to market, parish to parish," he says, adding that the fact of his being well-spoken and clean helped his marketing efforts. After a time, people began to request the product, and his operations were expanded to a shop along the roadway, where sales were conducted. "I later started using a taxi until I started hiring different units to do the transportation. Finally, I acquired my own personal transportation," he says proudly. Now Webb hardly has need for that transportation because the moment the roots tonic gets off the production line, buyers are lining up outside to take them away in their own vehicles. And demand for the product has been further stimulated by reference to it in lyrics of artistes like Bounty Killer and Vybz Kartel. "It sells so fast, we can't produce enough," Webb discloses. "We have people here from overnight to receive the product as soon as it gets off the line... We spend a lot of time turning down transactions." Six months ago, he moved his operations to a three-quarter acre-compound owned by businessman Pete Manboard in the vicinity of the Darliston square. Setting up there has cost in excess of $6 million, but the move is bringing him a step closer to achieving the greater synergy necessary for improved efficiency in his operations. "We used to operate from four different locations in the community because I didn't have the means to centralise the operation until recently," he explains. The new facility has been outfitted with a receiving area, a dehydrating area, a boiler room and a packaging area. They have the capacity to produce a half-dozen containers containing 36 cases, each with 24 five-ounce bottles of BABA Roots every two months. Webb says the plan is to improve significantly on that, by expanding the facilities and the number of their employees over the next couple of years. Not only is he now running a tighter ship, he also employs 38 people - most of whom are youths and a fact of which he is proud. "I wanted to lend my support to the younger people. I saw their plight and I am willing to make the sacrifice for them," Webb says. Success apart, Webb has recently had to scale back operations because of a short supply of bottles for the roots tonic.